ISS research fellow Dr Chandre Gould, an expert on the prevention of violence against children, was selected to deliver the keynote address at the National School Safety Summit in October 2018. The meeting was convened by Minister of Basic Education Angie Motshekga in collaboration with police and other government departments, in response to a culture of school violence which undermines effective learning and teaching. Challenges in South African schools include gang violence, weapons, sexual violence, bullying, assault and robbery. 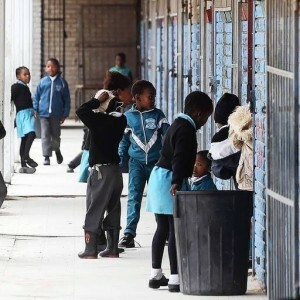 A Save the Children South Africa study found the cost of violence against children was a staggering R238 billion in 2015, about the same as the basic education budget. Gould’s invitation stems from the success of the national Dialogue Forum, which convenes government, academics and civil society in a long-term collaboration to understand and address violence against women and children. The ISS is a founding convenor of the forum, which has demonstrated impact at the highest levels of government. Gould drew the link between school safety and the physical and emotional violence which children experience at home and in their communities. ‘It affects their educational outcomes and wellbeing,’ she told delegates from teacher unions, learner representatives, school governing bodies, faith-based organisations plus business, development partners and academics. She shared her experience of interviewing repeat violent offenders in prison, and how their crimes invariably started with violence in their homes, schools and early lives. ‘We know that children who experience violence are more likely to be violent themselves, to use drugs, leave school early or have risky sexual relationships,’ she told the summit. Gould’s speech was extremely well received. Deputy education minister Enver Surty described it as ‘challenging and refreshing’. Minister Motshekga asked for a copy, and the Department of Basic Education’s chief director social inclusion and partnerships in education, Patricia Watson, said Gould’s presentation had helped to consolidate the summit. Fixing the problem called for the creation of safe communities, protective loving families, respectful, positive classrooms, and orderly schools. This required support from leaders who believe in the call for non-violence, including ministers, faith leaders, political party activists, teachers, unions, parents and learners. Gould proposed a number of solutions, including for children’s own needs and solutions to be heard. She pointed to ways the Department of Basic Education is promoting accountability with protocols for schools to report the incidence of corporal punishment and sexual violence. Resources need to be allocated appropriately, ensuring that civil society organisations delivering violence prevention services are sustainably funded. A national audit of violence prevention programmes was required. Gould suggested that programmes to encourage positive parenting and prevent violence should be extended to all government employees, noting that the benefit far outweighed the cost. Click here to watch a powerful new film about violence against children, made by the ISS with its Dialogue Forum partners, that was shown at the summit.